Q&A: What causes Pruney Fingers? Getting scientists started on whether or not we should genetically modify organisms is a bit like starting a discussion with New Yorkers about the Mets and the Yankees: Both sides are extremely opinionated, and everyone is quite certain they can convince the other side to see things their way. GMO supporters may not realize that they have a significant piece of evidence on their side that could sway their rivals. The truth of the matter is that GMOs are not exclusive to labs — rather, nature produces them every day. Recent research from a University of Valencia team explores one example of a natural GMO, one that arises from the relationship between wasps and caterpillars. Their insect orders, Hymenoptera and Lepidoptera, have not shared a genome since the pre-dinosaur days, 300 million years ago. That is, until now. To explain the return of genetic overlap, and to clarify why caterpillars worldwide are developing immunity to a deadly virus, Laila Gasmi and her team of researchers uncovered a little-known evolutionary drama. The wasp and the caterpillar have had a gory relationship throughout evolutionary history. Usually, the caterpillar suffers at the expense of the wasp’s reproductive success. When the wasp is ready to lay its eggs, it injects the eggs along with a malignant bracovirus into the body of a caterpillar host. The eggs become larvae, which proceed to feast on the host’s inner fluids. Meanwhile, the viral DNA from the wasp’s bracovirus inhibits the caterpillar’s immune response, allowing the wasp larvae to have free reign inside the host body. The larvae do take care to avoid the vital organs so that the caterpillar will live — after all, they need their host to stay alive until they are ready to hatch. When the fateful day arrives, the larvae, which have by now matured into pupae, use their razor-sharp teeth to burrow their way out of the caterpillar’s thick skin. Up to 80 wasp pupae emerge at once, timing their exits perfectly so that their final molt happens on their way out. As they swarm through the holes they drilled in the caterpillar’s skin, the pupae leave behind the top layer of their exoskeleton — a slapdash surgery that keeps the caterpillar alive just long enough for the pupae to manipulate it into helping them build cocoons. In its final moments, the caterpillar fights to defend its tiny trespassers before it eventually dies of starvation. This lovely mental picture is a testament to the extraordinary effect that organisms can have on each other in an ecosystem, and to the enormous power of the virus. When the small bracovirus invades the caterpillar genome, it alters its gene expression, not only by suppressing the caterpillar’s immune response but also by rearranging its cytoskeleton, disrupting the structural integrity of its cells. The bracovirus completely takes over the caterpillar’s cell machinery, enslaving it to the will of the wasp larvae. Still, the invasion of the wasp bracovirus is not a total loss for the caterpillar. Instead, it is a perfect example of the multifaceted nature of genes. While the bracovirus disrupts the caterpillar’s immune system and cell physiology, it also provides the caterpillar with immunity to another dangerous virus that affects many types of bugs: the baculovirus. If the bracovirus is ultimately going to assist in killing the caterpillar, why does this secondary immunity benefit the ill-fated insect? Imagine for a moment that a parasitized caterpillar has just suffered through the evacuation of its wasp pupae. It lies there as a mostly hollow shell, drained of its strength and energy. However, since the wasp pupae have not touched a single of the caterpillar’s vital organs, there is a slim chance that the caterpillar could regain its strength and recover from the attack. If it does make it through, it can go about its regular caterpillar days, munching on leaves, turning into a moth or butterfly, and hopefully avoiding future encounters with parasitoid wasps. And the wasp bracovirus remains integrated into the heroic caterpillar’s genome — the modification becomes a permanent part of its genetic material. So, when it reaches adulthood and has offspring of its own, it will pass some of its altered genes onto its baby caterpillars. Over the course of future generations, the evolutionarily useful trait from these viral genes — immunity to the baculovirus — will spread across the caterpillar species, converting the species into a population of natural GMOs. A specimen of a parasitized caterpillar as the wasp pupae make their exit is preserved with the wasp cocoons forming on its skin. When the University of Valencia team stumbled upon this feat of natural genetic engineering in September, they realized that this perseverant caterpillar’s life story could indeed be what happened in the species’ evolutionary history. In their research, the scientists found that pieces of the wasp bracovirus have been incorporated into the caterpillar genome through a process called horizontal gene transfer. 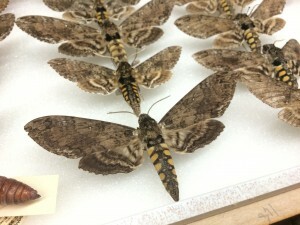 Their observations spanned moth and butterfly species around the world, from Canada to Australia, and found widespread evidence of bracovirus insertion, suggesting that elements of the virus are now fixed in the species. While this finding is good news for caterpillars, it also gives researchers a glimpse into just how much complexity there can be in one species’ evolutionary history. These variations have captivated scholars. 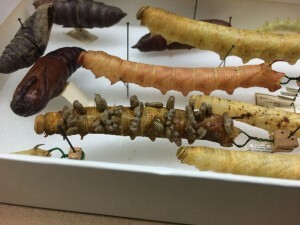 According to Larry Gall, an entomology specialist at Yale’s Peabody Museum of Natural History, evolutionary history research has risen dramatically in recent years. “What’s been happening in the last 15 to 20 years or so, particularly in the last 10, is people have been grinding up samples of anything they possibly can and subjecting them to mitochondrial and nuclear DNA analysis,” Gall said. Using modern DNA technology, researchers are looking to explore genetic relationships like that between the wasp and the caterpillar to resolve age-old questions about the evolution of species. While manmade GMOs have been controversial since their conception, this research on natural GMOs offers a new perspective on the debate. Leaving evolution to its own devices does not actually produce the unadulterated path one might think, and the results of natural genetic modification are often no less twisted — or beneficial — than what humans engineer. The tale of the wasp and the caterpillar finds that nature’s evolutionary course may be more complex than it seems.